The 1950’s was revolutionary for the world of furniture, architecture and the arts as a whole. The emphasis had naturally been on the post war market for value driven designs perfect for start-up homes. As the decade went on there would be a natural evolution in the quality (and cost) of most things, including the designs of Charles and Ray Eames. Into the early 1960’s however and there would be a change of emphasis towards the burgeoning workplace market. The original Eames Office, collaborating with Herman Miller, would transform the Alu Group into what is now quite possibly the most famous workplace seating across the globe. Their Eames workplace tables would be equally as distinctive and universal in their design, so much so, most of them are still in production today. The Eames workplace tables and workplace seating of Charles and Ray Eames effortlessly fitted together perfectly. The designs were smart, crisp and the quality was such that they added a high visual impact of professionalism. The almost open-ended combination of tops and bases made so many styles possible and there was always a choice for whatever the size of the space. The Eames workplace table series that made the most impact was that of the Segmented Tables. This ingenious design was all about the base. The design was so clever that the base could be extended or contracted, singular or doubled and using a series of connectable legs, bars and brackets. 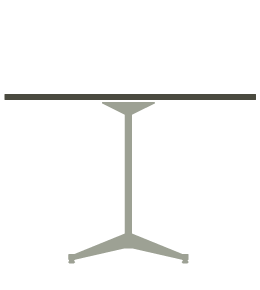 The possibility to change the size and configuration of the table base allowed for all shapes and sizes of table tops to be utilized. The intelligent aspect of the design did not impact on the style of the table either, as the parts were constructed with a combination of polished aluminium and contrasting black. The tops for the segmented tables came with many possibilities over the years. From natural veneers such as Rosewood, Walnut and Ash to those with durable laminated plastics in white or perhaps grey. All had a protective vinyl edging to guard the table from furniture impact and other damage. 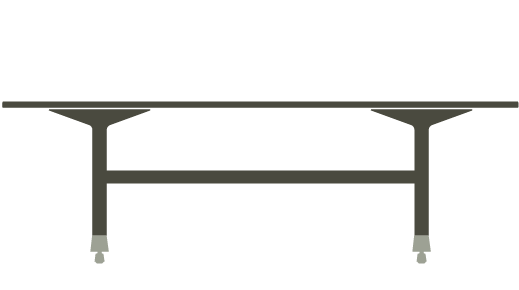 The tops were available circular, square, rectangular, and oval. They were also supplied in sections too for tables of greater physical size. The design allowed for singular small circular tables right through to boat shaped conference tables spanning up to 20 feet in length. The practical uses for the segmented tables was seemingly infinite and the design is one of the most understated and underestimated that ever came from the original Eames Office. 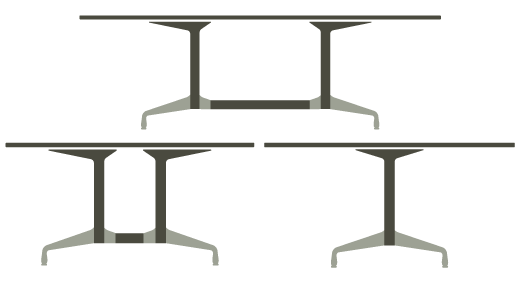 In line with the changing bases of the Aluminum Group workplace seating were tables using the same style of Contract and Universal bases to match. Unlike those of the Segmented Table, the bases were fixed and therefore there was a limit to the size of the tops that could be used but there was still a variety of dimensions and veneer options. The contract-based tables were the first to be developed, alongside the Alu Chairs, since 1957. The Universal bases were designed in the early 1960’s and were first seen on the Time Life Chairs. The base would eventually be used across the Alu Group series due to its practical versatility. The tables and chairs would be available in both base types for a period before the Universal type would take over. This golden period of Eames workplace table design would see one other added to the portfolio, the 2500 series. 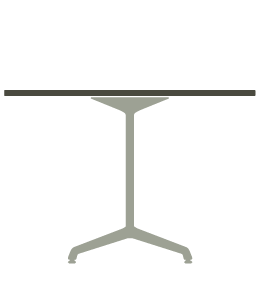 This table was using a parallel leg in line with the table instead of the offset type of the Segmented, Contract and Universal bases. It was also available in a range of widths and lengths and had the similar polished aluminium feet and legs. The life of the 2500 series was relatively short, making them quite rare finds today. It is likely that the popularity and versatility of the Segmented Based Tables rather left the 2500 series redundant.